We had a freezer full of sausage that I needed to use, so for Fathers' Day I cobbled this together with what I had. Unfortunately, I don't know exactly how much of each sausage I had, so this is estimated. It did, however, fill the crock pot to the inner brim. Into a pan, put one bag of sauerkraut (as will fit), and heat til bubbling. Add brown sugar and half of the beer, and mix thoroughly while heating another 2-3 minutes. Place in crock pot on low. The intention is to have a small layer of sauerkraut. Sprinkle a little bit of white pepper on top of the layer. Brown all of the sausage on as many sides as possible. Place in a single-piece layer on top of sauerkraut in crock pot. Set aside remainder. Add some smashed garlic in the holes between pieces. Heat remaining sauerkraut with remaining beer, adding Worcestershire sauce after heated. Mix and continue to heat another 2-3 minutes. Layer on top of sausage in crock pot, alternating with remaining sausage and garlic, and if possible have sauerkraut be the top layer. Grind a generous amount of black pepper on top. Heat in the crock pot on high 3-3.5 hours, or on low 5-6 hours. Serve on awesome rolls. 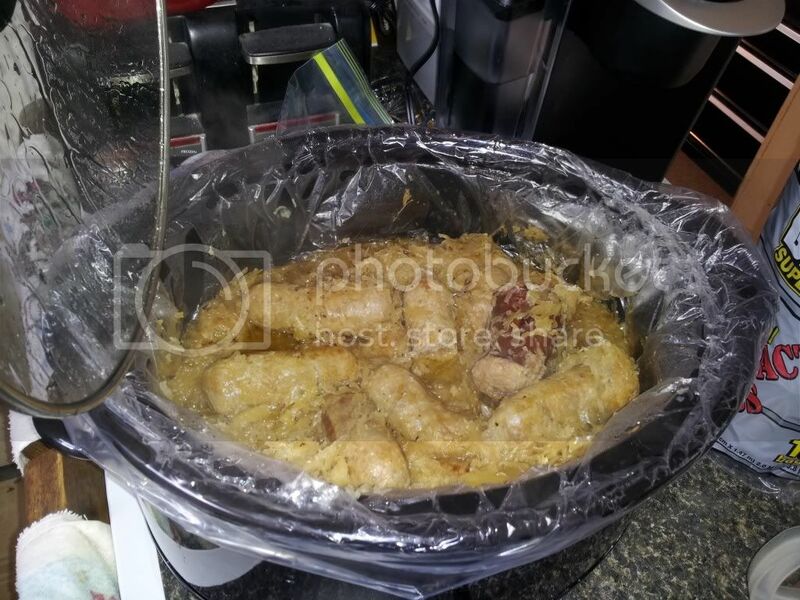 I imagine one could heat all of the ingredients together in the crock pot, after the sausage is browned, but I think the separate heating of sauerkraut with brown sugar/etc gave it a wonderful extra kick. I also probably could have done it all in a big pot, but I was going for expediency. This could probably be baked for an hour, hour and a half at 400, covered in the oven, if you don't want to use the crock pot. I've had something similar to this in german restaurants before. Sounds and looks really tasty. Going to have to try my hand at this one day. Sounds like Bigos which is quite delicious. 30 minutes before serving I cut some small potatoes in half lengthwise and just lay them on top of the kraut. Came out fantastic. Ribs were super-tender (bones practically fell out) but still had pork texture and taste, and the cinnamon gave the kraut a nice zing. I finally got a decent sized soup pot, so ended up rinsing all of the kraut thoroughly before mixing all of the kraut + non-sausage ingredients together then heating to combine before putting in the slow cooker. Saved myself about 20-30 minutes (minimum) compared to the original recipe. Also made it easier in general. The basic recipe is still the same and we continue to tweak it here and there or try "something extra" for a change of pace. One iteration had a large onion, sliced into quarter rings, dropped in. Another had apple slices. This one wasn't as popular; while the apple did lessen the bite of the kraut, it all but disintegrated and left little strings of apple skin. I wonder how peeled apples and/or apple juice would work. The apple sauerkrauts I've had don't include the apple skins. Just small diced apple chunks. I just checked YouTube and many sausage/kraut recipes use regular kraut and just add apple cider/applesauce to the kraut during the final cook. I know it isn't sauerkraut, but apples and red cabbage braised together in a pan is really good. I like it with Italian sausage in it.